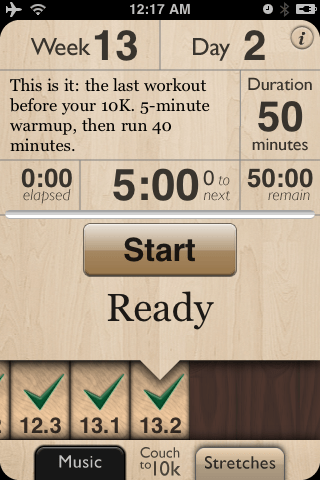 When deciding to start Couch to 10K, I asked the iPhone app’s developer, Lucius Kwok, where I should begin. He felt that a good place to start would be “week 4 or 5,” and I decided to follow his advice and begin at week 4 so that I would have a little more relaxed time acclimating to the new training regiment. Like Couch to 5K, the program begins with alternating walks and runs, but the number of repetitions is increased from the beginning. Even from the first day of the program, I was moving for about an hour and covered over 5 miles. This was longer and further than I had ever reached with Couch to 5K and bode well for the future. The training progressed with the same consistency I had experienced previously. Not only did I have to continue using the elongated path I ran at tend of Couch to 5K, but I had to find even more directions to run to continue to continue my runs. The problems for me with Couch to 10K came with the onset of summer. As the temperatures increased, I had more trouble running. This doesn’t reflect on the Couch to 10K program per se, but it made it harder to do the longer runs. The best run I had was in week 12, where the temperatures cooled and I ran at night over 8 miles. The cooler temperatures made it easier to run around the track and lessened my dehydration to the point where I didn’t feel the need to slow down or stop for a drink. The other problem I experienced with Couch to 10K was the final week. Week 13 consisted of 2 days, the first was a 50 minute run and the second was a 40 minute run. The problem for me is that even at my best, I tend to run an 8 minute mile, and I can’t do that for an entire 10k. According to Nike+, even my 8.1 mile run was at 9:33 per mile, so if I were to average 10 minutes per mile, I would not have completed a 10K in the 40 minutes that the program says I can run a 10K after completing. According to Nike+, my best time for a 10K is 58:14. Coming from being unable to run a 10K when I started in April, I feel like I make good time.